Since December 2017 I have been setting up and running digital activities in the new Makerspace at Oxfordshire County Library. We have a mix of robots, 3D printer, Raspberry Pi computers, gadgets etc. But until recently we did not have dedicated PCs in the room. That all changed when we were loaned an HP Sprout Pro (after use at the Glass Box in Somerset). Not only did HP provide this, but also 5 of the previous model for long-term loan. This has opened up a huge range of options for how to use them – in the words of some of our Code Clubbers they are ‘sick’! But what would be a suitable way to launch our Sprouts? Where and how can libraries add value to technology? One key aim for me in the Makerspace has been to work with the community and involve them with the activities we run. For instance, we have a number of developers and people in the tech industry in Oxfordshire who are looking to give something back. We have a very high demand for sessions from children and parents, and other users. And a number of organisations in the county want to work with the public and demonstrate social impact. Hopefully this event will show this. The Sprout Pro's object scanning capabilities were an obvious feature to highlight and stop-motion software would be a great way to engage younger children. Also around this time the BBC approached libraries to show some of their new VR content. I remembered one of our Code Club volunteers was a VR developer (Charlie George Animation) and was creating experiences of local towns for people to explore. 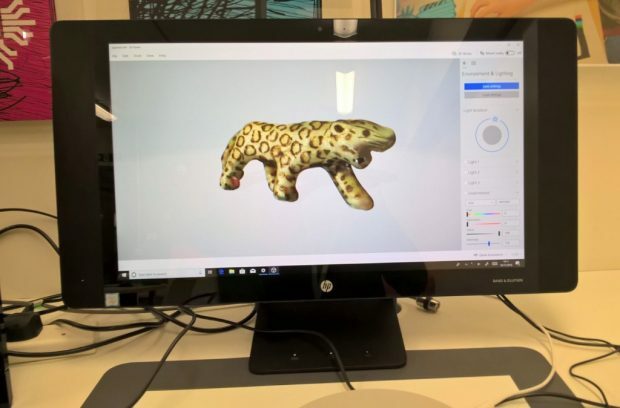 He was delighted to be asked to showcase his work and we combined this with object scanning on the Sprout so people could see the link between creating 3D models and interacting with them in a virtual reality world. We had also worked with Oxford Brookes University on a number of workshops as part of the Reading Machine project to make replicas of a 1930s invention that aimed to change the way reading took place. This project had an virtual reality component to it and they were interested in displaying the prototype machine. Bringing these elements together resulted in VR Day (by an amazing coincidence we were only one week away from a global initiative called VR Day for public VR demonstrations!). We had a brilliant day with people coming in from a variety of ages, backgrounds and level of familiarity with technology. 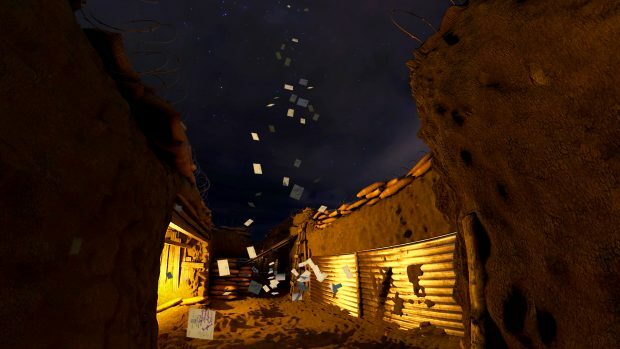 The BBC's VR experience 'Nothing to be Written' focused on WW1 and the experiences of soldiers through the pre-prepared postcards they wrote home, appropriate for the weekend of Remembrance Sunday. This, combined with music, was incredibly moving. Participants were immediately drawn into it - reflecting on it, curious to know more about the postcards, and rated it very highly (even those familiar with VR). It was straightforward to demonstrate and we were fortunate to be lent two Oculus Go headsets for the event. There were no issues with ‘motion sickness’ - it seems this issue has been ironed out in recent years by developers. Libraries can really make use of their book stock to let people take their experiences of VR further, by linking the digital experience with relevant printed books. Charlie's Oculus Rift was a big draw and being able to explore a local place made it much more relevant to people. The Sprout computers were explored thoroughly and excitedly by children and everyone enjoyed trying out the 3D scanning, producing lots of ducks, tortoises, jaguars and skulls! Creating content is a great way to empower and engage people and I would recommend including this in any Makerspace activity or tech showcase. The day as a whole brought people together through similar interests and led to lots of discussions around VR and excitement at it being available in the library, and showed that technology and the community can lead to events that have a real impact and change the perception of libraries. Furthermore, a local VR group is interested in using the space; we hope to turn the Makerspace virtual, and run a future Reading Machine workshop with a VR component. 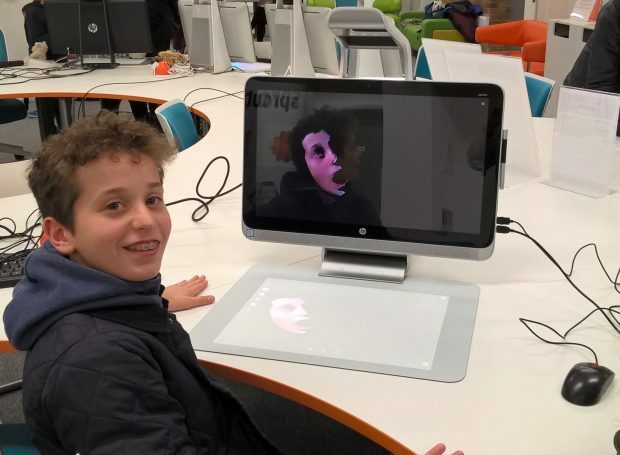 A very big thank you to our partners and the equipment they provided to enable it to happen – I still can’t quite believe virtual reality is happening in libraries! To keep up to date with activities in Oxfordshire libraries, follow them on twitter or browse the list of activities on their website. And bookmark the makerspace web page.